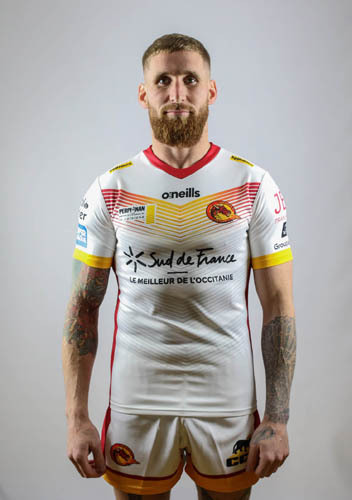 Sam Tomkins is one of Super League’s youngest and brightest talents, his exciting style of play has seen him become a household name in the world of Rugby League.He started his career at the age of seven where he played for Chorley Panthers amateur club. From there he moved to Wigan St Pats where he developed as a youngster and attracted attention from the famous cherry and whites.Progressing through the academy and the reserve ranks, local lad Tomkins was quick to impress with his pace, work rate and most importantly his attitude. His immense work ethic saw him earn his full first team debut in the Challenge cup against Whitehaven in 2009, where the young full back registered five tries.2009 was to see Tomkins cement his place in the Super League Dream Team, and deservedly earn his place as Wigan’s first choice Stand Off. Sam scooped himself Wigan’s player of the year award as well as the Super Leagues Young Player Of The Year Award.Carrying on in his rich vein of form in 2010 Tomkins retained his place in Super League’s Dream and added another 15 tries to his tally. Appearing in every one of Wigan’s Super League fixtures, Sam switched to stand off, occasionally playing at scrum half helping the Warriors on their way to their first Super League title since 1998Sam’s natural ability to see gaps in defences and pick the right passes has seen him open up defences almost single handed at times. In 2011 he finished as Wigan’s top scorer with a total of 33 tries. He also finished Super Leagues top scorer with 28 tries.Tomkins work rate was rewarded further when he picked up the Club Player of the Year Award, the Players Player and Coaches Player of the Year; he was also shortlisted for the prestigious Man of Steel Award. Sam was named in the 2011 Dream Team at full back and on the International front he also figured for his country in the Gillette Four Nations Tournament.His abundance of pace, neat hands and tidy footwork make him one of the most exciting players to watch for both Wigan and Great Britain alike.